Hey guys! 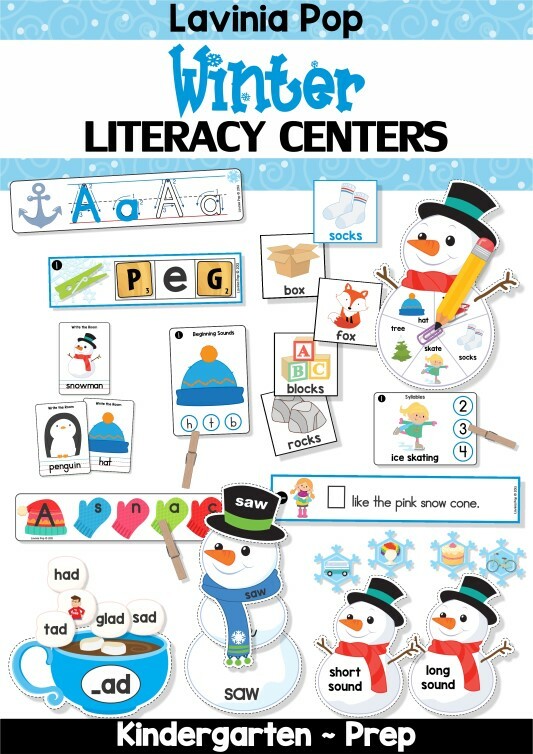 Here’s a sneak peak at the updated Winter Literacy Centers for Kindergarten packet. PLEASE NOTE: This blog post contains sample pages from my Winter Literacy Centers for Kindergarten packet. You can download the free sample pages by clicking on the photos. 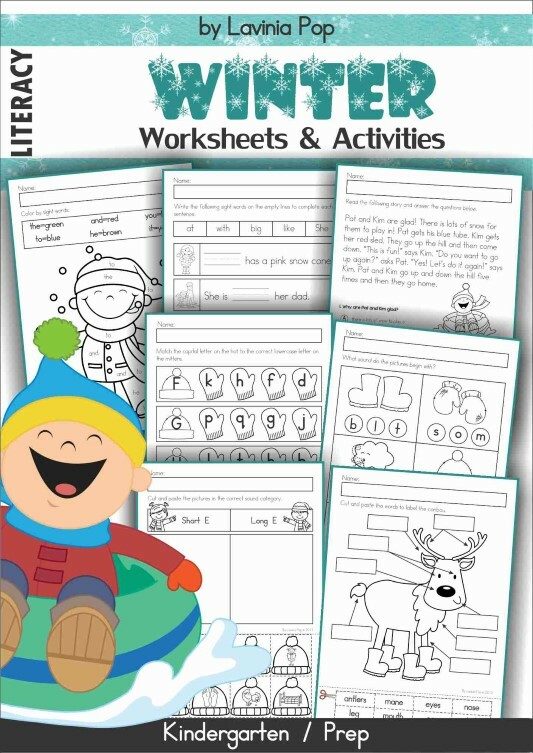 To purchase the complete Winter Literacy Centers for Kindergarten packet, please click here! To prepare the cards for use in a write and wipe center, print, laminate them, and then cut them apart. The intention of this activity is for children to practice correct letter formation with a dry-erase marker. The cards can be kept in a book-like format by making a hole in the top left corner and securing together with a key ring or a pipe-cleaner. 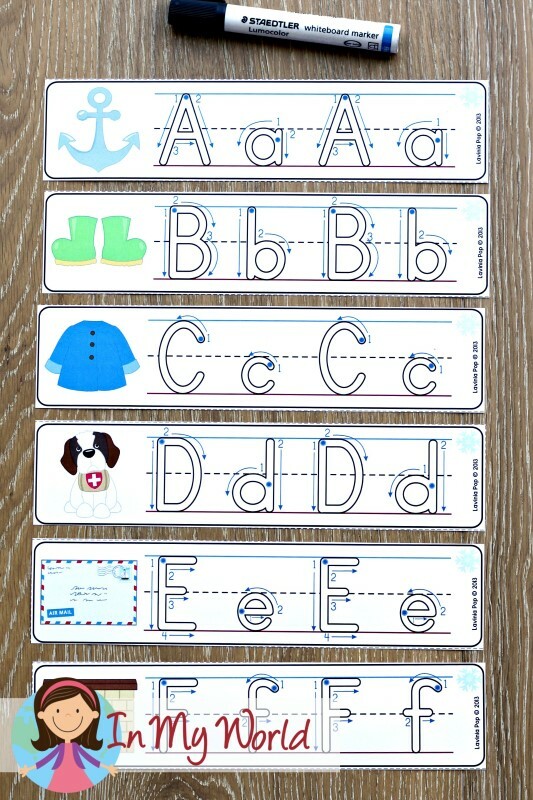 To prepare this activity for use, print the cards, laminate them and then cut them apart. Household pegs, or other small clipping items such as unused hair clips or paper clips, can be used for this activity. The aim is for children to clip a peg on the mittens with the lower case letter that matches the upper case letter on the hat. Print, laminate and cut out the picture cards. The aim of this activity is for children to correctly identify the beginning sound of each picture and to clip a clothes peg to show their answer. Alternatively, children can use dry-erase markers to colour the correct beginning sound. You will need to supply children will Scrabble letter tiles or other small letters for this activity. To prepare the cards for use, print, laminate and then cut them apart. Children are required to identify the missing letter at the beginning and end of the word and place the letter tiles in the squares to show their answer. To prepare this activity, print, laminate and cut out the sorting hot chocolate mats and marshmallow word and picture cards. The aim is for children to identify the ending for each word and sort it to the correct word family hot chocolate. Print, laminate and cut out all the cards. You will need to supply children with a paper clip and a pencil to make a spinner. Children being by laying out in a row the blue header cards. They spin the pencil spinner on the snowman spinning card and read the word where it stops. Children then find a matching rhyming picture and place it under the blue card it rhymes with. This continues until all the cards have been used up. To prepare this activity, print, laminate and cut out the snowman and snowflake cards. The aim is for children to identify the type of vowel sound for each of the pictures on the snowflake and sort it to the correct snowman. To prepare this activity for use, print and cut out all the cards. The aim of this activity is for children to sort the sight words and build a snowman using them. Print the blue and red strips. The numbered blue strips each contain a sentence with a missing sight word, while the red strips contain the words that are missing. The aim is for children to read the sentence, identify the missing word and write it on their recording page. Of course, if you prefer a no prep packet, I also have a set of winter worksheets for kinder kiddos available here. Thank you for creating and sharing these wonderful resources!!!! These are perfect for January literacy centers! I enjoy all of the activities you have created.